We invite you to join us in Amsterdam on 17th May. We’ll be at Startupbootcamp Marketing Summit looking to know more about you. Office Hour is One-on-One interaction with one of the members of SBC team. The goal of this event is to offer startups the opportunity to present their ideas to experienced industry experts and get valuable feedback and advice on their ideas. 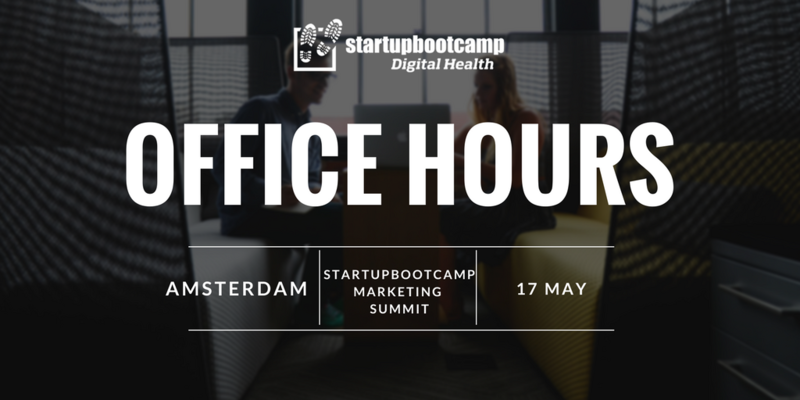 You also get a chance to know more about Startupbootcamp Digital Health, Berlin, and how can you benefit from it. Our experts are experienced mentors and investors who love to connect with startups and share valuable industry insights. The earlier you come, the better your chances of being selected for Office Hours. Networking with Digital Health community. The opportunity to meet up with one of our team members in person and get to know the whole experience that we are offering to you. Surprise us with your innovation, and join us in the Office Hour. On the day of the Office Hour you will be asked to give a short presentation of your startup and we’ll explain our unique acceleration experience.